Technovation, a flagship program of non-profit Iridescent, is the world’s largest global tech entrepreneurship competition for girls. The program offers girls around the world the opportunity to learn the skills to emerge as tech entrepreneurs and leaders. 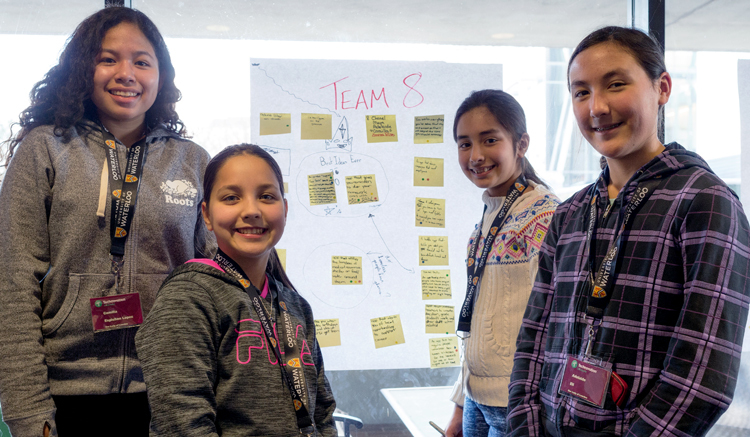 Every year, Technovation challenges girls from 10 to 18 years of age to build a business plan and mobile app that will address a community problem. Since 2009, more than 15,000 girls have participated from more than 100 countries. Over 12 weeks, teams with one to five members, along with a mentor, learn how to develop a concept for an application addressing an issue or need identified in their community, map out a business plan, and create a prototype app — all while learning the basics of marketing and programming. Ideally, all girls on a team should either be in the same middle school or same high school. They should have a sponsoring teacher, who can facilitate organizing the team. Teams will be paired with men and women who work at tech companies in and around Kitchener-Waterloo. Teams are responsible for finding time to meet as a group weekly, either in person (e.g., at school, at the library, at a member’s home) or online (e.g., via Google Hangouts). In addition, monthly workshops will be held at the University of Waterloo and local tech companies that augment the online curriculum and provide extra support for key aspects of the challenge. These workshops are also an opportunity for participants to get to know each other and to interact at greater length with industry mentors. See our Registration page for more information about workshops. At the end of the program there is a competition where teams pitch their businesses to local judges and compete for prizes. The top teams move on to the semi-finals globally online, where they will have a chance to win a spot in the top 10 to pitch in California. Student — You are a girl in Grade 7 to 12 ready for a fun experience in a team of up to five amazing girls. You can commit at least four hours per week for the program (about 50 hours in total). Mentor — You are a professional working in the field of technology in the private or public sector or a teacher. No coding experience is necessary. You will be paired with another mentor to work with a team. Mentors meet regularly with their teams, providing guidance, encouraging perseverance, problem solving and connecting them to resources they need. You should be ready to commit 20 to 25 hours from January to April. Teacher — You are a teacher in middle or high school who will sponsor a team. Your role is to help form one or more teams at your school, and to facilitate communication with the team during school hours. You do not need to attend any sessions or meetings, although you are welcome if you choose to participate. Would you like to see previous submissions to Technovation? We tend to learn best by looking at examples of what others have done. Here are two submissions where you can see a team's pitch video, demonstration video and photo. Ready to take a step and get involved in today’s important global issues but still on the go? LeftOvers is an interactive app that connects volunteers, vendors and local charities and NGOs. The volunteers get live notifications for food pickups, vendors can post a food donation and charities can collect. Volunteer drivers, donors and charities all stay informed and enabled for optimal routing and delivery. Rescue food that would otherwise be thrown into the landfill. ​Byll logs an individual's environmental actions. A person will be able to track progression toward living a more eco-friendly lifestyle. A community leaderboard shows how well they and the rest of their community are doing. The app also includes a weekly challenge for extra points to further motivate people to do at least one good environmental deed a week. The challenge also shows how many people have completed the task, which shows how small actions add up. Interested in joining the Technovation Challenge? Participating in Technovation is free. Find out how to register.